In my pursuit to create works that bring art and life closer together, I create works that incorporate into the everyday. My objective is to make an audience aware of the worth derived from ordinary human actions and bring value to what would be normally overlooked. I record my geographical locations and movements, and then find methods to transform the data into visual records of ritual and movement. The lines rendered are specific to my personal being; however the underlining concepts are purposely designed to address the inevitable conditions of all human existence, establishing a the method of recording and reflecting on daily experience that can be executed and recreated by any person anywhere. The resulting drawings produce a heightened awareness of locality and community, and highlight the value attainable through ordinary action. The minimalist qualities of the drawings further promote art's accessibility. Despite the work's simple appearance, the images contain a considerable amount of thoughtfulness and emotion. My vision in creating art out of the everyday aligns the same political economy of free and open source software idealism, where the collective product of human labor and knowledge benefit society. The goal of the work is to stimulate an audience to an awareness of the rich intellectual connections that can be cultivated between aesthetic experience and decision-making in daily life. Since 2008 I have been documenting my movements by creating a drawn shape that corresponds to (or “plots”) my geographical inhabitancies and connecting each of those locations in order of inhabitance to commemorate each day. As a result, I have become more conscious of my actions and the aesthetic impact every movement has on the day's final drawing. My natural objective is to coordinate my daily schedule in a way that allows me to create the most aesthetically rich shape possible. There are days, however, when I will lose primary control over the outcome, but I attempt to compensate later on by eliminating or adding places to inhabit during the day. When exhibited, the completed drawings are displayed sequentially in a grid that communicates my life's narrative. Viewers are able to distinguish my daily routine through the repetitiveness of similar shapes and they can recognize any substantial life changes when they see a considerable transformation in pattern. The drawn shapes are an extension of language and coherent writing, intended to communicate my autobiographical history through the rituals of motion. A shape ends and a new shape begins each midnight, wherever I am. For most days the single shape is created within a twenty-four hour time frame, however, exceptions such as Daylight Savings Time or traveling through a different time zone will either extend or reduce the allotted time to make the shape. Regardless of the amount of time the shape reflects in its formation, it is always fitted to the same-sized calendar square as all other days. The shapes are also an invention towards environmental problem solving. The daily shape that I desire most (and that brings me the most satisfaction) is a shape of equilateral proportions. This inclination is associated with the embedded human instinct towards objects and imagery with the aesthetic beauty of symmetrical form. The simplest way to attain this ideal shape is by utilizing destinations close to one's home. Moving deeper into the environmental crisis, it is crucial for individuals to begin finding and embracing community in the most profound ways. Adopting an analytic understanding of one's relationship to one’s lived space within local community fulfills this urgent need and makes art an essential device for survival and living. In March 2015, I went back through the archive, of my daily travels, and assigned a number to every place I visited in the sequential order according to the first visit to that location. The numbers are based on the GPS coordinates used to create the daily drawing. The series is a study to examine my relationship to places over time and their relevance to both my past and present life. The work reveals the rhythms underneath the system of my daily line drawings, particularly the back and forth of day-to-day routines. Patterns are visible in the static imagery. This is caused by the shape of the numbers. When a new place is visited for the first time, its number visually isolates it in relationship to the numbers of other locations. The work has a correlation to the butterfly effect and chaos theory. The narrative of the numbers is both deeply personal and non-personal simultaneously. The overarching concept of the numbers is to create another sensibility of being a tool for bringing awareness to our place within the world. The second series of numbers, expressed in Roman numerals, examines the relevancy of returning to place over time. 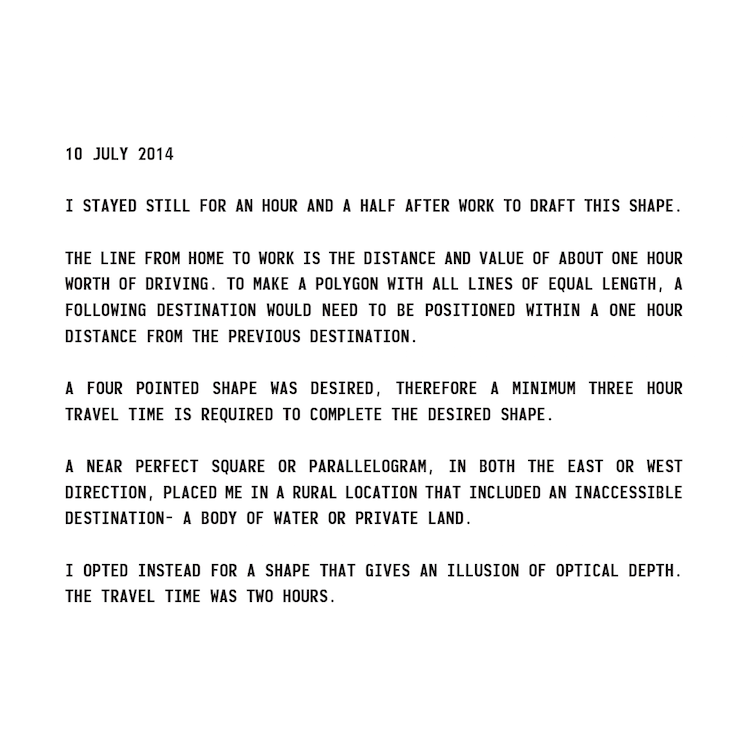 Each numeral represents the sequential day, within the documentation, when a place was first visited. When a series of new places are all visited within the same day, the new places are assigned the same value and are considered to be of the same entity. Roman numerals were selected to make the day series visually distinguishable from the location series. When exhibited, the visual outcome and patterns created in the composition are considerably different when compared to the Arabic numbers. This is caused by later days in the documentation to have equal character weight as an earlier day because of the Roman numerals being an additive and subtractive system. Found in the process of creating the visualizations was a serendipitous and visceral response to once lived time. The Roman numerals articulate the unpredicted occurrences and mysterious recurrences in one’s life. The numerals are a still of time and become a film strip when sequenced together. The numerals are a cinematic approach to storytelling that adapt to the idea of living in Samsara concept of cyclical time.